Happy Friday!! I am so excited it is Friday!! Zach & I are going to get Chinese food for dinner & it's apparently amazing....so I can't wait for six o'clock to roll around! Since I've moved, it's been a bit weird. I've pretty much stayed cooped up in the apartment because there's not much to do. I don't really like it! Besides going to get some work done at Starbucks, I don't really leave the house :( If any of you have moved in the past, what did you do to get to know your town better? How did you pass the time?? I'm struggling here! Any way, I've been typing away at the ebook & guess what...it's so close to being finished!! I hope to finish it a week early just so I can go back through & double check. If you want to grab a sneak peak at the ebook, make sure you sign up for the newsletter. I would hate for you to miss out! The ebook will be released on September 1st & I just can't wait. The colors of these wallets are just gorgeous. I am loving all three! Color has been a bit absent from my life lately & I need to get back to discovering, pairing, & all around loving color. Perhaps I'll make a Pinterest Color Palette for a pick me up. Speaking of color, this super fabric designed by A Beautiful Mess has me drooling. I love the patterns, the colors, the bold print....love it all!! It's got me feeling inspired, oh yeah! I guess this is leading up to something because as I type I am getting so excited to play with these & other colors. I am looking to add a few more blog designs to the shop & these might be winners! This grand hand drawn poster by feature sponsor Diana of Livy Love Designs. Pick it up in her shop & check out her cool blog header. Wowza! Amazing, right? I actually have a print of her's that I am hoping to share with you all before the end of September. I reeeeaaallllyyy wanna get it up in our new house! Hell, I just want to get into the new house! I get to see it for the first time on Saturday.....I know I am going to fall in love! I hope you're having a wonderful Friday! Fan Friday is a weekly feature showcasing lovely things from around the web often focusing on the awesome content Five Sixteenths' sponsors post throughout the week. If you think there is something awesome out there that I need to see, let me know! If you're interested in sponsorship, please click here. Want more Fan Friday inspiration? Click here! 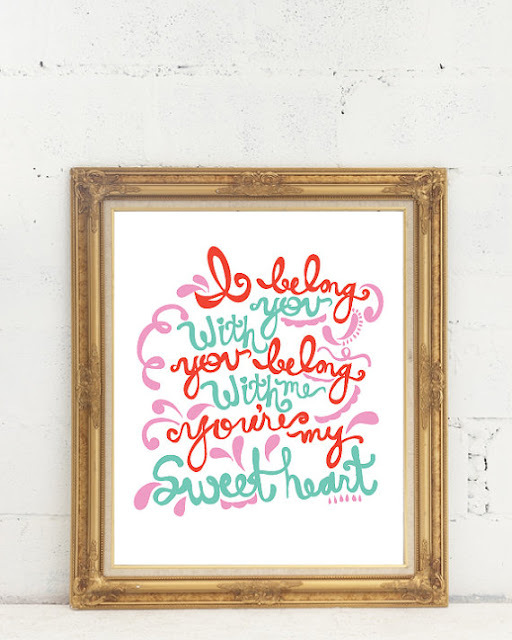 I love the song that the lyrics on that print are from, By the lumineers I think? Either way, Colour is such a fun thing to play with and think about, it's definitely one of the reasons I love art so much! Best of luck with wrapping up the e-book, I look forward to seeing how it turns out! I love the colored wallets, too bad I just bought a new one at UO. Like hearing about your new adventures in Michigan, sounds like it's going pretty well. Explore your new town by googling and see what you get! Just get out there and explore! When I moved to where I am currently, I didn't realize just how close I was to all of these cute towns. I mean I know about the river towns and how "artsy" they are but they're all really close. I just wish I had my own car so I don't have to rely on my bf.